You have seen mineral origami paper in the store and not thought much about it. It isn’t flashy like some paper (lookin’ at you, Yupo.) It’s just sheets of white origami paper, sure, but this unassuming package holds a very versatile product inside with so many possibilities! Mineral paper is a product that uses rock mineral instead of paper pulp. Specifically it uses calcium carbonate, for those who speak rock. The result is something that kind of feels like yupo, but softer. Softer doesn’t mean this stuff is weak though. (We prefer to think it’s just sensitive.) It is tear and water-resistant - I drenched this stuff and didn’t hurt it one bit, so resistant seems to be an understatement - making it ideal for outdoor projects and projects needing a little bit more sturdiness than traditional paper. 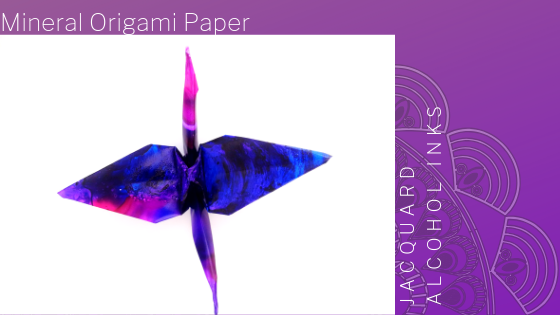 If you have a problem with tearing while folding origami, this paper is a perfect solution for you. It can, of course, be used like traditional origami paper, but really what makes this stuff special is how flexible it is with different wet media. First off, not a single medium bled through. You may be able to see the shadow of the other side as this stuff is pretty thin, but no bleed through at all. That means you can experiment with both sides. Pick one that works better, or find folds that show off both sides of the paper. With this paper your patterns are only limited by what you can create. How well does it work really - like really, really? Without rushing it to dry the paper did not warp at all. I am not a patient soul, however, so when I put it under the heat gun it only warped a little. After letting it set for a little bit and then pressing it under a little weight it did lay out almost completely flat again. In general, this paper can take a second to get used to. It is pretty forgiving, but that also means it doesn’t hold creases very well. It did hold actual fold pretty well with gentle pressure. I went SUPER heavy on the alcohol ink in the above image so it made the paper a little harder to get a fold but only relative to how smooth the paper is without a ton of ink on it. I cannot praise this paper enough for its versatility and durability. Anyone interested in origami/watercolor/alcohol ink/so many other things should definitely try it out. Ready to give it a try? Or maybe you have used mineral papers for other projects. Be sure and let us know in the comments.